Fearing Deportation From U.S., Migrants Walk To Canada Migrants who believe the U.S. is more likely to deport them are heading into Canada, many on foot. They're taking advantage of a loophole that says they won't be turned back right away. A man from Congo is frisked by Royal Canadian Mounted Police officers after illegally entering Canada, near the border with Champlain, N.Y. The U.S. has ended a temporary residency program for almost 60,000 Haitians who had been allowed to legally enter the United States after an earthquake in 2010. The program, called temporary protected status, allows people from nations hit by conflict or natural disaster to remain legally but temporarily in the U.S. for up to 18 months. TPS has often been extended, allowing some people to remain in the U.S. legally for several years. Now that the program is ending, there is a flow of people crossing the border into Canada by foot. They are taking advantage of a footnote in a Canada-U.S. treaty that says those who cross by foot won't be turned back from Canada until their case is heard. More than 9,000 people seeking refugee status in Canada entered the province of Québec from August through October. By comparison, just over 2,400 crossed by foot along the entire U.S. border with Canada last year. The decision to terminate TPS leaves Haitians with a deadline to leave the U.S. by mid-2019. Mayor Bill de Blasio of New York City, where 5,400 Haitians live, has expressed his dismay over the decision, noting that Haitians have long been "making our city better." Dr. Jay Helias, a physician, was visiting the U.S. when the 7 magnitude earthquake tore into Haiti and was permitted to stay under TPS. She continued her career in New York. "When they said they were ending TPS, I felt crushed," she said. "It was never in my mind that that they would put you in a situation of being deported. Because there were other countries under TPS for many years, I really didn't think that it was going to be something that will stop abruptly." Starting in May, there were signals that TPS was being reconsidered, signals strong enough that people began to think about trying to enter Canada before TPS was canceled. Since the announcement, calls from along the Eastern Seaboard, from Haitian communities from Miami to Boston, have come into the Brooklyn office of Haitian-born New York City Council Member Mathieu Eugene. The office arranges legal aid for constituents. "What they're scared of is, they don't want to stay here and get kicked out," said one of Eugene's aides, Vladimir Edouard. "Canada is giving them an opportunity." After cresting this past summer, the crossings continue at places like Roxham Road, a lonely stretch of pavement north of Champlain in upstate New York. A spokesman for the Royal Canadian Mounted Police said crossings take place daily. Many of the migrants, like Thomas from Haiti, said they are afraid to share their last name. Thomas said Haiti hasn't nearly recovered from the earthquake. The country is also plagued by large-scale floods, the most recent in November. "I almost [lost] my life," he said. "So I look for a place to go." Champlain resident Janet McFetridge offers those crossing a little help staying warm. "Do you need any warm socks?" she asked Mansour, who also did not want to share his last name. "No, I have some in my luggage. Thank you. God bless you," he replied. Mansour then gazed for an instant at the border. His eyes were sullen, his expression gloomy, and he moved slowly. He said that his U.S. work visa is scheduled to expire in two months and that he can't contemplate the risk of returning to war-torn Yemen. "[There is] suffering, and it is an unsafe place," he said. Mansour started walking slowly but deliberately on the final steps to the border with Canada. Canadian police tried to stop him and a family of five Nigerians. "This is Canada, right? If you cross the line here, you'll be arrested for illegal entry," the officer stated from the Canadian side. "Do you understand?" The group said it did. They crossed and were arrested. People are crossing the northern border because of a legal paradox known as the U.S.-Canada Safe Third Country Agreement. It's a treaty with the U.S. that says that if a person makes a claim for refugee status at a legal border crossing into Canada, they'll be sent back because the U.S. is considered safe for refugees. 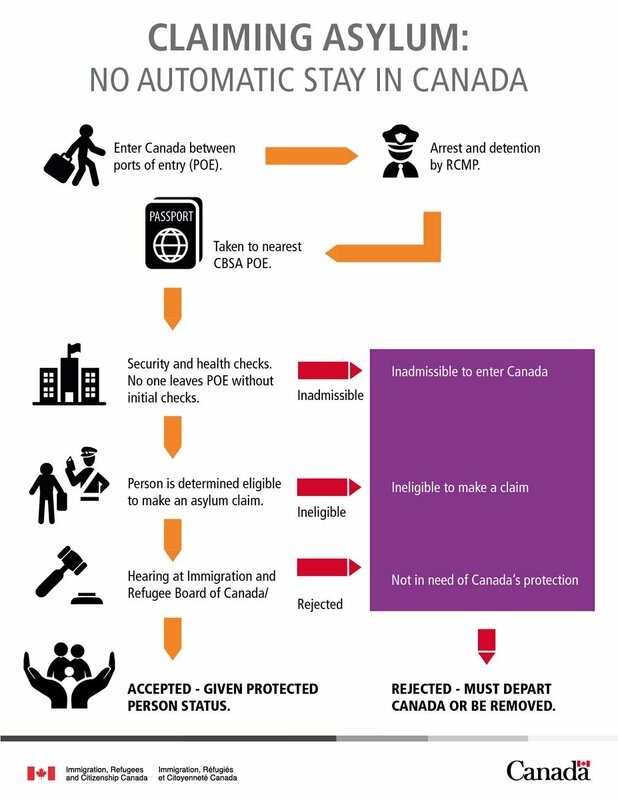 But if you can somehow cross into Canada illegally, the treaty doesn't apply and you can remain in Canada while your case is decided, a process that can take years. "I'm not sure that going to Canada is the best decision for all of them," said McFetridge. "But I just think it's very, very unfortunate that people are leaving our country to go into a future [with] certainly no guarantees. And many of them are going to be deported into terrible situations. I just wish we could help them more here." 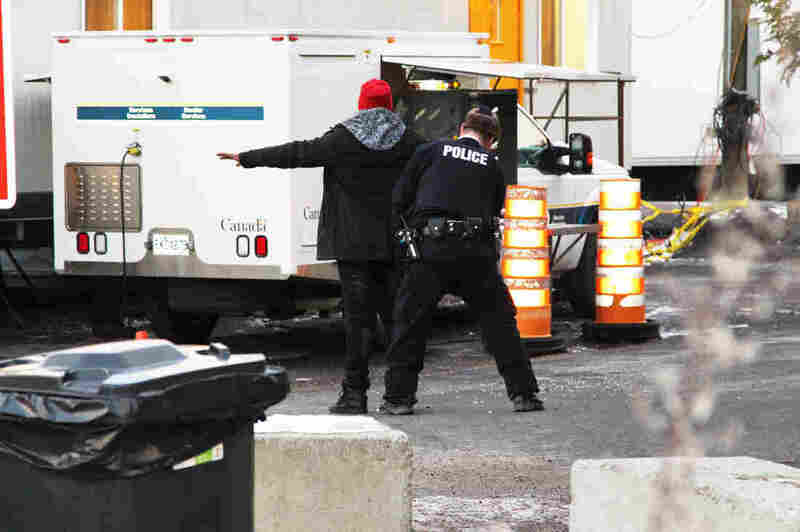 Canada has increased deportations of would-be refugees this year. McFetridge hands out gloves and hats with her friend Wendy Ayotte from Havelock, Quebec, a village of 750 people on the Canadian side of border. Ayotte is unwavering in her opposition to the Safe Third Country Agreement. "We want the Safe Third Country suspended or annulled altogether because we don't think the States are safe for refugees anymore," Ayotte stated. She is not alone. Calls in Canada to cancel the agreement are growing. More than 200 lawyers along with law students have been gathering evidence to mount a legal case against it. Amnesty International has also called for an end to the treaty. "I think we are all shocked by the numbers," said Eric Taillefer, a member of the Quebec Association of Immigration Lawyers. In his office in Montréal, Taillefer said allowing refugees to apply at a legal crossing would allow Canada to focus more on security, because presumably someone with, for example, links to terrorism would not consider a legal crossing. "Then if you cross in somewhere else, we could ask the question: 'Why did you cross this way? Are you a security risk?' "
On the border, a man from Burundi told an RCMP officer that he can't return to the African nation. "They going to kill us over there," he said in a voice raised so that the officer could hear him clearly. Even after crossing, the process of getting admitted permanently to Canada is uncertain at best. People keep coming illegally, however, because while their claim for refugee status proceeds, they know they won't be deported.